Contact Me directly for coupon code – 45% off – coupon expires on 11.30.2017 !!! ✅ YOUR VALUABLES ARE SAFELY HIDDEN FROM PICKPOCKETS. Worn under clothes and being lightweight ensures the money belt is discreet and invisible to others. It’s slick not cumbersome at all. ✅ FORGET ABOUT CARRYING WATER BOTTLES. Front pocket with bottle holder and room enough to store a bottle or sunglasses. The sideways bottle compartment allows you to walk and bend down easily without the water bottle poking into your abdomen. ✅ PROTECTION FOR YOUR PASSPORTS, CREDIT CARDS AND VALUABLES FROM HIGH TECH THIEVES AND FROM RAINY WEATHER. 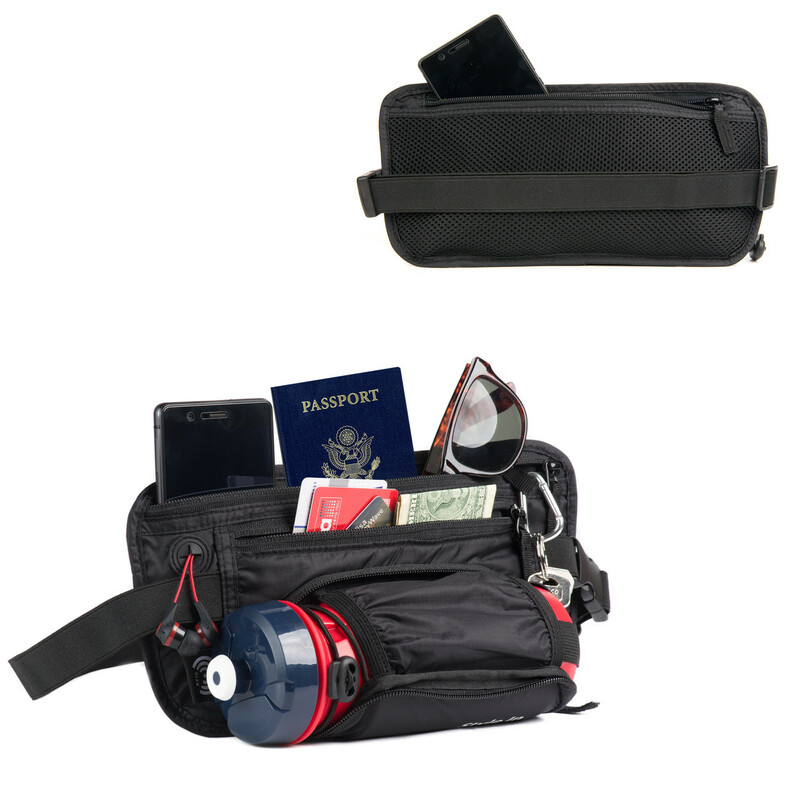 Our money belt provides smart RFID blocking features for the middle front pocket against hacker identity scanning. The soft and water resistant fabric features high quality 210D nylon ripstop, plus 4 best waterproof reverse coil zippers. Not designed for swimming or diving. ✅ EASY ADJUSTABLE ELASTIC STRAP WITH SAFE BUCKLE. High quality, soft and reliable strap is adjustable to fit a large range of waists for women, men and teens from 23" up to 55". It’s snug to avoid play when running. ✅ IT FEELS GREAT BEING LIGHTWEIGHT, ROOMY, ADAPTABLE, STURDY AND COMFORTABLE TO WEAR. We used a silky and soft black material to give you comfort especially when worn under clothes. The bag is very practical and carefully organized: 3 front zipper pockets (including the water holder), 1 back zipper mesh pocket, and carabiner key holder. Easy fits all kinds of large smartphones inside. ✅ LISTEN YOUR FAVORITE MUSIC OR HOT NEWS AND STAY IN TOUCH WITH FAMILY AND FRIENDS while traveling, shopping, and doing sports. Fitted also with earphones access for your large smartphone inside. ✅ GET ADVISE ON TRAVEL TIPS AND TRICKS WITH OUR TRAVEL EBOOK BONUS ($17 RETAIL PRICE) + 100% SATISFACTION GUARANTEED OR YOUR MONEY BACK. If for any reason you are not completely satisfied with your purchase then simply contact us and we’ll give you a full refund.